Pouring cold water on the hopes of four crore subscribers, the government today notified 8.5 per cent interest on the Employees Provident Fund for 2005-06. The notification is likely to provide fresh ammo to the trade unions and the Left parties to attack the UPA Government, who have been critical of several policies of the Congress-led coalition, especially with an eye on the elections in the red bastion slated for May this year. Intel today launched its latest mobile platform- Centrino Duo- for new-generation laptops. With key components designed in the company’s Intel India Development Centre at Bangalore, this is the first platform created in India, which would change how people the world over interact with technology. India’s efforts to bring natural gas from Myanmar via Bangladesh may remain a pipe dream if Dhaka fails to come to terms for a trilateral agreement in the next two-three months since Myanmar is seriously considering alternative buyers, including China, Thailand, South Korea and Japan. After Infosys Chairman N.R. Narayana Murthy , Biocon Chairperson Kiran Majumdar Shaw has claimed that the flight of capital from Bangalore was imminent with the present Congrss - Janata Dal (Secular) Government not bothering about infrastructure development. The government is actively considering allowing 100 per cent FDI in airports through the automatic route, doing away with the FIPB clearances. Punjab has taken the lead in fruit productivity as its yielding capacity is recorded at 22 tonnes per hectare, against the national yielding capacity of 8.35 tonnes per hectare. The government will completely exit from Maruti Udyog Ltd, minister for Heavy Industries Sontosh Mohan Dev said today. “We have offered to the Finance Ministry that it can sell 10.24 per cent stake in Maruti that will be left (after the current round of disinvestment). It is up to the ministry to decide,” he said. Noted industrialist Inderjit Singh Pahwa, Chairman of the Avon Group of Industries, breathed his last at Hero Heart Care Centre here this morning. The government said today it was in favour of selling public sector Andrew Yule's entire 26.22 per cent stake in Tide Water Oil company to ONGC. Volvo today announced that it was growing at a rate of 70 per cent in India with a sales turnover of Rs 600 crore in 2004. This was disclosed at a function to launch its new FM tipper, which is aimed at mining and construction market. Union Labour Minister Chandrashekhar Rao had raised the hopes of EPF subscribers by promising the “best return” for them after the Central Board of Trustees of the EPFO recommended an 8.5 per cent interest rate for the fiscal. Mr Rao also met Prime Minister Manmohan Singh and urged upon the Finance Ministry to pitch in for the sake of EPF subscribers. The Prime Minister at the Indian Labour Conference had stated he would talk to the Labour Minister on the EPF issue and do whatever was possible within the resources of the EPFO. He, however, ruled out any budgetary support to retain the EPF interest rate at 9.5 per cent as demanded by trade unions and some political parties, including Left parties supporting the UPA from outside. The Employees Provident Fund Organisation will meet the deficit liability of Rs. 365.89 crore on account of the 8.5 per cent interest rate from its own resources, the statement said. The EPFO will have to pay Rs 6,889.04 crore as interest to its subscribers for the current financial year while its projected interest income will be Rs 6,523.15 crore. A one percentage point reduction in the EPF rate was suggested as the EPFO had ended up with a deficit of Rs 716 crore in 2004-05 by offering a high 9.5 per cent interest. The deficit was met through the reserve fund which is now left with a corpus of Rs 250 crore. Rao had urged upon the Prime Minister to take up with the Finance Minister the issue of raising the interest rate of Special Depository Fund where about 65 per cent of the EPF fund are invested. However, his efforts yielded little. Announcing the launch of the dual processor - an evolution of Pentium M processor- here today, Senior Vice-President of Intel Corporation Anand Chandrasekhar said this was the biggest leap for the company after having developed the Pentium processor. “This platform is going to change the way mobile computing works. The performance of the notebook computer having Centrino Duo will be enhanced by 70 per cent.A wide array of notebooks have been designed especially for this processor by Samsung, Toshiba, LG, Acer, HCL, Lenova et al,” he said. This mobile dual-core processor manufactured by using the company’s leading 65 nanometer process technology boasts of a unique design with two processors in a package, roughly the size of a large postage stamp. “Intel is focused on creating an innovative computing platform that ushers in a new era of working, playing and living, especially when the laptop market is growing annually at the rate of 100 per cent in India. Elaborating, Mr Anand Babu, Director, South Asia Sales and Marketing Group, said this platform featured enhanced three dimensional graphics (up to two times previous generations), and the option to view high-definition TV. “It has a better multi-tasking performance and collaboration capabilities, including voice and video over IP,” he said. By the beginning of 2007, etrino duo would replace the Centrino processor currently used in the notebooks, he added. He also said that Intel Corporation was now engaged in designinmg rural PCs, which would cost around Rs 10,000. Mr Dayanidhi Maran, Union Commerce and Information Technology Minister, who presided over the launch function, said the launch heralded the transition of India from a low-cost technology hub to a centre for developing cutting-edge technology. Exhorting the company management to set up a semi-conductor manufacturing facility in India, he assured all government help for the purpose. “We have already lost a year, and if we fail to have an understanding with Bangladesh in the next two-three months, we may virtually lose the project. The Myanmar government is seriously considering other buyers, including China, Thailand, South Korea and Japan,” a senior official of the Ministry of Petroleum and Natural Gas, told The Tribune. Sources said Bangladesh had been vacillating due to domestic political opposition to the project. Further, it has asked India to offer transit rights to Nepal and Bhutan for goods and electricity in exchange for the gas pipeline along with a transit fee. Mr Mani Shankar Aiyar, Union Petroleum Minister, who has held extensive talks with his counterparts in Myanmar and Bangladesh, has proposed a tripartite agreement for laying the 290-km pipeline estimated to cost $1 billion through Arakan (Rakhine) state in Myanmar, Mizoram and Tripura before crossing Bangladesh to Kolkata. India has proposed to Bangladesh to join the project that can help it transport its own gas within the country, besides providing a substantial transition fee. Meanwhile, experts have ruled out, said the official, the option of laying an undersea pipeline bypassing Bangladesh due to technical and cost factors. The second alternative - to lay a pipeline from the Myanmar-India border to North- Eastern India was still under consideration. “GAIL has undertaken a feasibility report for this alternative, but found the cost of the project and length of pipeline almost double than the pipeline through Bangladesh, which would ultimately raise gas costs to end users,” said the official. Further, the Indian Government and Petroleum Minister Mani Shankar Aiyar, he said, were not too keen to explore that option as it would be a “permanent sign of failure” in bilateral relations between New Delhi and Dhaka. Speaking to a television channel here,she also claimed that the present government was only indulging in coalition politics and that the main issues of infrastructure and law and order were being ignored. She also ridiculed the decision to go for a name change to Bengaluru, saying that Bangalore was a very powerful brand. Investment in the city was happening due to this brand image and that now people would see a flight of capital from the city to other cities who are willing to spend on infrastructure. “The same magic which worked in Bangalore earlier is set to be replicated in other cities”, she said. Without naming anyone, Ms Shaw apparently made it clear that her anger was directed against former Prime Minister and Janata Dal (Secular) President H.D. 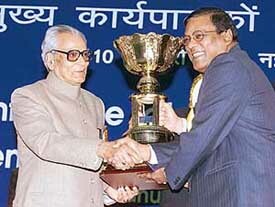 Deve Gowda by stating that Mr Naryana Murthy and Mr Azim Premji (of Wipro) had paid a price for speaking up earlier. Mr Gowda had accused the Infosys Chairman of criticising the state government at the behest of his bete-noire and former Chief Minister S.M. Krishna. The Biocon Chairperson also indicated that she would like the issue of developing infrastructure in Bangalore to become a people’s movement. She said she would like people to raise their voice on the issue, saying that protests by her and a few other corporate heads were not enough. She also made it clear that politicians could no longer ask corporate heads to run their business and leave politics to them, a statement which has been made by Mr Dewe Gowda earlier. “People like me have invested a huge amount of money and need help from the government to secure their investment”. She said if the government was not committed on development now, it was reneging on a promise which had ensured investment in the state in the first place. She said she had tried to work with the state government and also interact with the Centre to get investment into Bangalore but to no avail. “All the projects seem to go on for ever”, she said, adding that the last straw for her had been a drive to the airport which took three hours. The government is actively considering allowing 100 per cent FDI in airports through the automatic route, doing away with the FIPB clearances. The Commerce Ministry has suggested a slew of FDI policy changes and the Group of Ministers headed by Agriculture Minister Sharad Pawar is evaluating the pros and cons before allowing 100 per cent foreign participation in development of airports through the automatic route. Currently, 100 per cent foreign participation in the sector is allowed but there is a sectoral cap of 74 per cent. If the foreign company wants to invest more than 74 per cent, it has to apply for FIPB approval. The Commerce Ministry wants this to be simplified by doing away with the FIPB route, as the activities in the airports sector are regulated by the Civil Aviation Ministry and the DGCA, official sources said. This was stated by Mr Jasjit Singh Randhawa, Minister for Cooperation and Horticulture, while talking to mediapersons here today. He said orchards covered 47,000 hectares in Punjab, of which 22,488 hectares were under citrus fruit cultivation, adding that another 4,000 hectares were being brought under horticulture during the current financial year. He said farmers who had small holdings were being motivated and encouraged to diversify by switching over to horticulture, adding that almost all fruit crops had been generating more income than agriculture produce. He said fruit processing units of Rs 35 crore each were being set up at Hoshiarpur and at Abohar, which would further benefit horticulturists in the state. Referring to the Punjab Cooperative Act, Mr Randhawa said it had provided powers to only the officers concerned. To minimise their powers, the state government had drafted a self-supported cooperative Bill, which would be introduced in the next Assembly session, he said. He said elections to 70 per cent of the cooperative institutions had been conducted and the Congress had won in 75 per cent of those. He said the Punjab Cooperative Agriculture Bank and the Punjab State Cooperative Bank had been adjudged best for their overall performance in the country by NABARD. Referring to the loan recovery of cooperative banks, he said a 1 per cent increase had been noticed during the current financial year, which would be enhanced. He said to improve the economic condition of farmers, their credit limit would be doubled in three years, as per a direction from the Centre. He said the interest rate on cooperative loans had been reduced from 14.5 per cent to 10 per cent, which would be further decreased. The process of sale of 8 per cent shares in the company by the government has reached the final stage. Financial bids have been invited from public sector financial institutions for the stake. Tomorrow is the last date for submitting the bids which will be opened on Thursday. Noted industrialist Inderjit Singh Pahwa, Chairman of the Avon Group of Industries, breathed his last at Hero Heart Care Centre here this morning. According to family members, he suffered a massive heart attack following which he was rushed to Hero DMC, where he died. His cremation took place at Model Town extension cremation ground this afternoon, which was largely attended. The deceased was the brain behind the Rs 500 crore Avon Group. He also ran Nihal Singh Pahwa Charitable Hospital. He is survived by wife, two sons and three daughters. The news of his demise sent a wave of grief among the local industry. The government said today it was in favour of selling public sector Andrew Yule's entire 26.22 per cent stake in Tide Water Oil company to ONGC. "ONGC has already done due diligence for the company," Heavy Industry Minister Santosh Mohen Dev told newspersons on the sidelines of a seminar organised by Standing Conference of Public Enterprises. Tide Water Oil, which makes lubricants, is a subsidiary of Andrew Yule and Company Ltd, which is into industrial equipment and tea business. 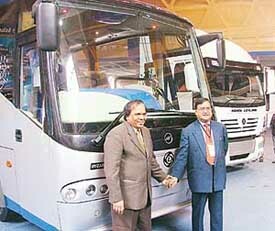 The company said despite a flat growth in the Indian truck market, Volvo had sold 700 trucks in 2005. Volvo India Managing Director Eric Leblanc disclosed that the company had sourced sales of 50 million euros from India. The new truck will cost between Rs 56 to 59 lakh.